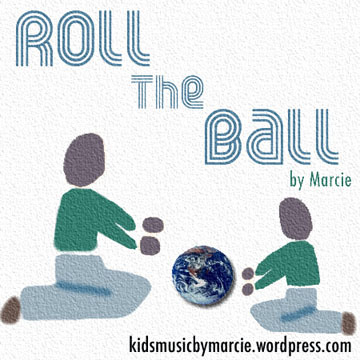 Roll The Ball- (Action Song for Infants & Toddlers) Roll The Ball is a circle time action song for infants and toddlers. Promotes: socialization, hand eye coordination, sharing, and musical fun. Activity Idea: I use an inflatable earth ball in my music classes, as part of the song is promoting the idea that we all share this round ball we call Earth. If your baby is too small to move the ball, you can be sure he/she will be watching the group interaction with great interest and enjoying the related music. You can always pick your young crawler up under the arms and gently swing his/her feet out to kick the ball too! In a larger group, it helps to have more than one ball.